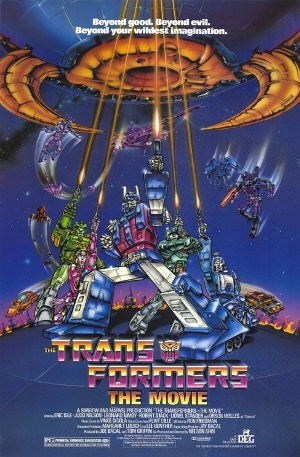 One of the most important movies from my childhood is Transformers: The Movie. Not the Michael Bay garbage with his “can’t tell them apart” computer animated robots. They don’t hold a candle to the 1986 version that was based on the original cartoon. What made it so special? As a writer I can tell you that it was because it was not the sugar-coated nonsense that we were used to at the time. It was something different. The characters went trough great trails, suffered, and many of our favorite characters died. I was around ten years old when I first saw the movie and my mind was blown. I’ve heard rumors of parents complaining about the film, too. This movie broke new ground by killing off the iconic character, Optimus Prime. To top it off, it happens at the beginning of the movie. Apparently kids were crying in the movie theaters. Who can blame them? Optimus Prime is a beloved character and this was new territory for a kid’s film. It stuck with me, though. It made more of an impression of me than any other film I watched as a kid. The reason is because it taught me that there would be dark hours in our lives. When Optimus Prime dies in this movie it is sad. It tugs on your heartstrings. This is a character that has fought for good his entire life and his reward is dying for the cause. It is noble and heart wrenching at the same time. It reminds me of the sacrifice the Christ as made. He came to Earth and fought for us. He created such a ruckus that everyone became his enemy. It got to the point where they tortured him to death for it. That was all a part of the plan, though. All the pieces fit together in the end. Jesus knew he would die for the sins of the world. He knew that action would free us from sin. He knew that his suffering would open a door to heaven for all of the world. And after he rose from the grave we were set free. Matthew 28:6 He is not here: for he is risen, as he said. Come, see the place where the Lord lay. Transformers: The Movie has another unique aspect about it. Optimus Prime doesn’t come back by the end of the movie. He’s dead. He’s gone. The main characters have to deal with their own problems without any help. That is how I feel with God some days. I’m running the course on my own and without any help. That is not really the case, though. God loves us all unconditionally and even though it may feel like he has forgotten us, he is still there. We carry him in our hearts, but I think we get used to the feeling and forget that we let him in there. In Transformers, the character Hot Rod has the burden of facing the “darkest hour”. That’s a direct quote from the movie. We all have our darkest hours. It is when God seems to do a disappearing act. It is when our parents die, we are laid off from our jobs, we get into trouble with the law, our spouse cheats on us, or we into an accident and lose our legs. The darkest hours can get very dark, but remember that God is the light in our darkest hour. In the movie Hot Rod reaches the point where all hope is lost. That is when the Matrix he carried with him opens up and shines a light. That light transforms him into someone knew. That is how God is working with us, too. These dark moments are only moments. The darker it gets the brighter the light will shine. God will not give you any trial that you can not handle. His light will shine and you’ll be made into a new creature. You will be a stronger, more Christ-like version of the person you are now. Just remember we have to reach our darkest hour in order for the light to shine its brightest. John 12:46 I have come as a light into the world, that whoever believes in Me should not abide in darkness.